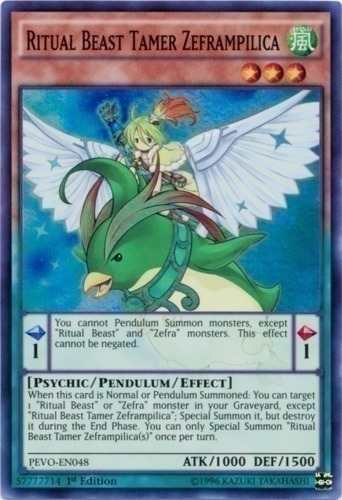 Pendulum Effect: You cannot Pendulum Summon monsters, except "Ritual Beast" and "Zefra" monsters. This effect cannot be negated. Monster Effect: When this card is Normal or Pendulum Summoned: You can target 1 "Ritual Beast" or "Zefra" monster in your Graveyard, except "Ritual Beast Tamer Zeframpilica"; Special Summon it, but destroy it during the End Phase. You can only Special Summon "Ritual Beast Tamer Zeframpilica(s)" once per turn.